The decorating work in this 3 story town house was the final part of a $200,000 restoration project. 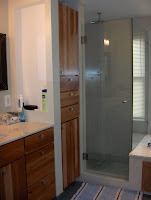 As well as new electrical, plumbing and HVAC work, two new luxury bathrooms and a kitchen were installed and the top floor was completely remodelled into a self-contained suite. 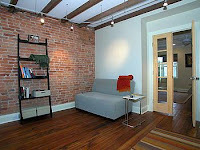 The top floor was converted from a single attic space into a master bedroom, den and ensuite bathroom. Then I moved in. The exposed ceiling beams in the den were cleaned off to bare wood and stained. The infilled area between the beams is insulated, plasterboarded, taped and filled. I have specified the same “dry-lining” ceiling treatment on a huge holiday chalet in the Dordogne and a farmhouse in Wales. The “secret” to the really sharp look is to use a caulk gun to create the finished joint between the wiggly beams and the plasterboard. In my experience, if it is a top floor ceiling, it won’t crack along the joints and will look as good as new for years. 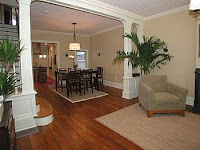 The red pine floors were the main selling point of this house, because that tree no longer exists in America! Almost 2000 square feet of floor boards were salvaged, stripped to bare wood, and coated with a couple of coats of microporous (breathable) OS Color Wood Wax. A quick wipe down with a lint- free polishing cloth keeps OS waxed woodwork looking good for years. Any scratches can be sanded out and the wood re-coated. I always mask up flooring when I paint skirting boards, not because I can’t paint a straight line free-hand, but because it is quicker and safer that way. And if there are big gaps between skirting and floor, if you don’t want to risk spoiling the good work of the floor-sanding crew, or spoil any flooring for that matter, I make sure the masking tape is pushed underneath. Ordinarily, with wooden flooring, I would consider lapping masking tape a couple of millimetres onto the skirting. This ensuite bathroom with glass-enclosed shower and jacuzzi is finished with cherry units, slate floors and marble – with satin bathroom paint on the walls and ceiling. I find it is best to spend time at the start of a refurb job masking and covering everything with paper and plastic sheets. That way, there is no worry about spills or spots of paint on expensive marble etc, it is easy to vacuum up dust, you can work fast and it ensures a sharp finish. And homeowners love it. 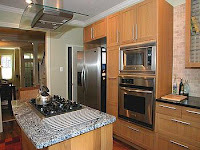 The new wood kitchen boasted lots of granite worktops and stainless steel hob, ovens and fridge. All the skirting boards, cornices and frames were new pine, made to a traditional over-size design. I finished them with a very expensive acrylic-based satin enamel, which they claim is as good as oil-based paint. 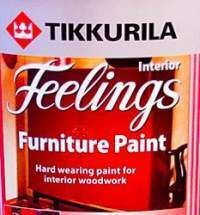 In my opinion, acrylic paint is brilliant for keeping its colour, it is low odour, quick to apply, and great for skirtings and frames. On the downside, though, it didn’t seem durable enough for window cills and doors, the two places that get the most wear and tear. Also, after spending weeks burning off, rubbing down and filling the woodwork throughout this property, everybody who saw the finished effect was very impressed. However, from a tradesman’s point of view, when I think of the finish I can get quite quickly with oil paint, I would say that acrylic paint is a poor product for refurbishment work on a traditional property. Update I have since got the hang of working with acrylic paints, and if you focus on the priming and surface filling before applying top coats, there is a lot to be said for working with water-borne paints. The advantages are especially noticable on a site where dust kicked up from elesewhere in the property would be a major headache to control if painting with oil finishes. And to keep the house looking traditional, for the entranceway into the lounge we imported two rolls of anaglypta and paste from the UK. The order cost something ridiculous, like $120 for materials that would have cost $50 in UK. Luckily it looked a million dollars painted a traditional deep olive green gloss.